[119 Pages Report] The telecom Application Programming Interface (API) market size is expected to grow from USD 93.69 Billion in 2016 to USD 231.86 Billion by 2021, at a Compound Annual Growth Rate (CAGR) of 19.87%. The base year considered for the study is 2015 and the forecast period is 2016–2021. The objectives of the report are to define, describe, and forecast the telecom API market size on the basis of type of APIs, user types, and regions; provide detailed information regarding key factors influencing the market growth (drivers, restraints, opportunities, and challenges); track and analyze the market scenario on the basis of technological developments, product launches, and mergers & acquisitions; and forecast the market size of market segments with respect to five main regions, namely, North America, Europe, Asia-Pacific (APAC), Middle East and Africa (MEA), and Latin America. This research study involves extensive usage of secondary sources, directories, and databases (such as Hoovers, Bloomberg, Businessweek, Factiva, and OneSource) to identify and collect information useful for this technical, market-oriented, and commercial aspect of the telecom API market size. The figure below shows the breakdown of primaries on the basis of company, designation, and region, conducted during the research study. The telecom API market ecosystem comprises vendors such as Vodafone Group PLC (London, U.K.), Twilio, Inc. (California, U.S.), Alcatel-Lucent (Boulogne-Billancourt, France), AT&T, Inc. (Texas, U.S.) Telefonica (Madrid, Spain), Apigee Corporation (California, U.S.), Orange S.A. (Paris, France), Verizon Communications, Inc. (New York, U.S.), Xura, Inc. (Massachusetts, U.S.), Nexmo, Inc. (California, U.S.), Fortumo (Tartu, Estonia), LocationSmart (California, U.S.), Tropo, Inc. (California, U.S.), and Aspect Software (Massachusetts, U.S.). 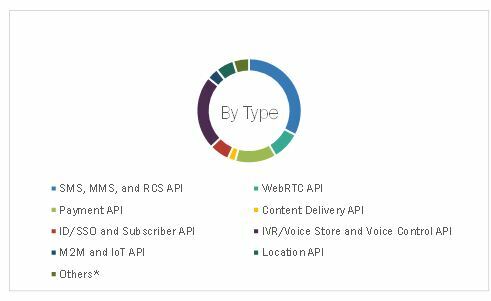 The telecom API market report is broadly segmented into the following types of APIs, user types, and regions. An API is a set of commands, functions, protocols, and objects the developers use to create a software or to interact with an external application or system. It serves as an interface between different software programs and facilitates their interaction. For instance, the Windows API provides developers with user interface controls and elements such as Windows, scroll bars, and dialog boxes. Telecom APIs allow carriers to pass valuable data to third parties, which they monetize on an asymmetric basis, as typically mobile network operators do not provide services to the end-users. Telecom APIs are a means of accessing telecom services and data for a variety of communication enabled applications. In emerging economies, mobile operators are the main enablers of the digital economy. Telecom operator APIs are a powerful channel for unlocking creativity and boosting the startup ecosystem. The set of APIs offered by the operators creates a powerful cycle of innovation as startups have the ability and scope to combine several APIs to create new services. A startup offering SMS-based localized content to its users depending on their city would leverage three operator APIs simultaneously: SMS, location, and direct operator billing. Thus, startups and developers in emerging markets building mobile services using operator APIs are a major opportunity in the global telecom API market. MarketsandMarkets forecasts the telecom Application Programming Interface (API) market to grow from USD 93.69 Billion in 2016 to USD 231.86 Billion by 2021, at a Compound Annual Growth Rate (CAGR) of 19.87%. Improving telecom API user experience, monetization of telecom operator services, rising demand for advanced telecom services over the internet and increasing adoption of Machine-to-Machine (M2M) devices among end-users are some of the major driving factors of the telecom API market. The objectives of the report are to define, describe, and forecast the telecom API market size on the basis of types of APIs, user types, and regions. Based on the types of API, the location API is the fastest growing market that helps in driving the market during the forecast period. The booming interest in location-based services spanning the verticals is driving the growth of this segment and the rising significance of providing more contextual experience to the customers using mobile devices is driving the location API segment. The Short Message Service (SMS), Multimedia Messaging Service (MMS), & Rich Communication Service (RCS) API has the largest market share in the telecom API market during the forecast period. Its market share is expected to grow because of the increasing need for monetizing telecom carrier services and the demand for improving mobile app developer experience. Interactive Voice Response (IVR)/voice store and voice control API has the second largest market share during the forecast period due to the increasing adoption of M2M devices among end-users. Among telecom API users market, the partner developer market is expected to grow at the highest rate, followed by internal developer. The partner developer enables solution developers to access their different APIs and use these APIs to develop applications and extensions of these applications to build and develop solutions that are more sophisticated for clients. 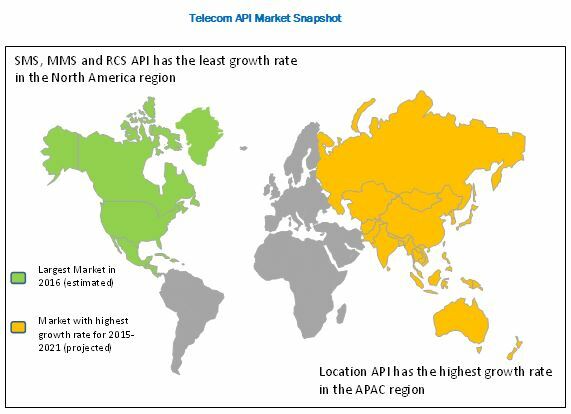 North America is expected to hold the largest market share in 2016 and APAC is projected to grow at the highest rate in the telecom API market during the forecast period. Increase in use of smartphones and mobile applications has resulted in the wide adoption of API related technologies in this region. The increasing innovative developments in technologies are benefiting all the stakeholders present in the market. 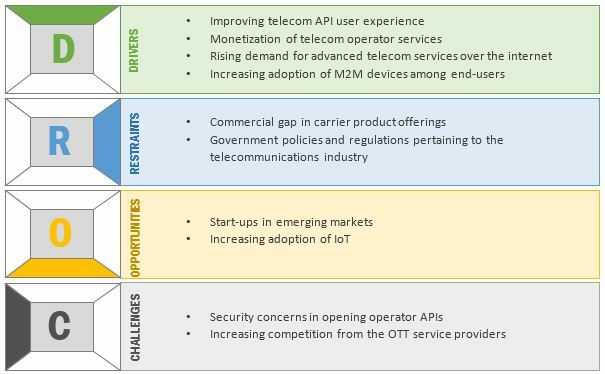 However, commercial gap in carrier product offerings & the developer needs and government policies & regulations pertaining to the telecommunications industry are the restraining factors for the telecom API market. The major vendors in the telecom API market are Vodafone Group PLC (London, U.K.), Twilio, Inc. (California, U.S.), Alcatel-Lucent (Boulogne-Billancourt, France), AT&T, Inc. (Texas, U.S.) Telefonica (Madrid, Spain), Apigee Corporation (California, U.S.), Orange S.A. (Paris, France), Verizon Communications, Inc. (New York, U.S.), Xura, Inc. (Massachusetts, U.S.), Nexmo, Inc. (California, U.S.), Fortumo(Tartu, Estonia), LocationSmart (California, U.S.), Tropo, Inc. (California, U.S.), and Aspect Software (Massachusetts, U.S.). These players have adopted various strategies such as partnerships, agreements, mergers & acquisitions, and new product developments to achieve growth in the global market. 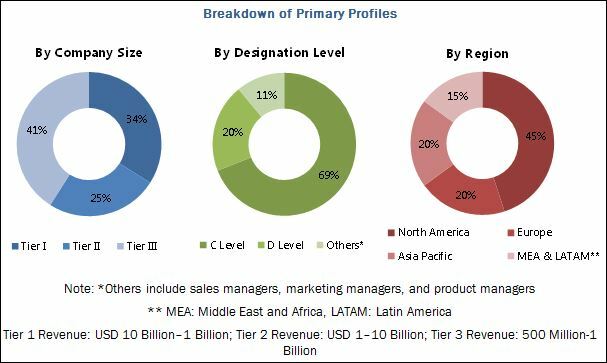 The growth of telecom API market is depending on the factors, such as improving telecom API user experience, monetization of telecom operator services, rising demand for advanced telecom services over the internet, and increasing adoption of M2M devices among end-users. The SMS, MMS, and RCS API segment helps in sending bulk SMS offers, triggers transactional updates & OTPs, receives inbound SMS, and manages contacts. The MMS API helps in creating visual customer experiences with attachments and picture messages. RCS aims at improving messaging functionality, which along with text messages helps in high-quality picture messaging, group chats, location sharing, and video calls. The RCS API aims at exposing RCS capabilities to the web and mobile app developers. Smart IVRs empower the enterprises by enhancing their sales and marketing initiatives. For instance, call centers can process millions of calls per hour to manage real-time data by using a smart IVR system.Thus, IVR or voice API enables to build high-quality applications integrated with voice calling and IVR capabilities. Digital payments have become the mainstream for a large set of verticals, including retail, BFSI, manufacturing, education, and hospitality. The payment API segment enables innovation and new ways to approach payment transactions. The webRTC API segment enables the applications to capture and stream audio and video media as well as exchange data in real time. Data sharing and peer-to-peer teleconferencing is enabled without requiring to install plug-ins or any other third-party software. SSO helps the users to authenticate from one application and automatically be logged into another one. The SSO API when integrated with an app gives the users seamless access to the app without reauthenticating. The location API segment facilitates adding location awareness to the applications with features, such as automated location tracking, geofencing, and activity recognition. The IoT trend that links all the devices in real time can be driven and empowered by a robust telecom API strategy. For IoT to be useful, the devices that make up this mesh must be connected to the cloud, which can be achieved via APIs. Cloud-based services are the way in which the IoT is connected to the data. Telecom APIs serve as the bridge between IoT on one side and useful information- & data-capturing capabilities on the other. The other segment of the global telecom API market comprises advertising API, QoS API, and authentication API. Which are the top use cases where telecom API can be implemented for revenue generation through new advancements such as artificial intelligence, IoT, and cloud computing? What are the potential opportunities in the adjacent markets?